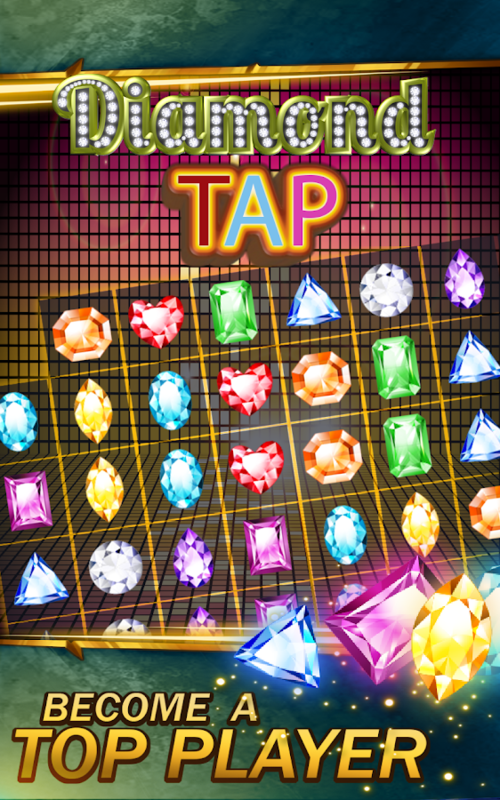 Diamond Tap is a fun match 3 jewels Diamond game, there are manydifferent levels,each level has different rules, limited moves,limited time, blow a hole in the screen with special Diamond Tapbombs, or start diamond twister lightning stormsjust tap and swipeto match 3 or more diamonds. 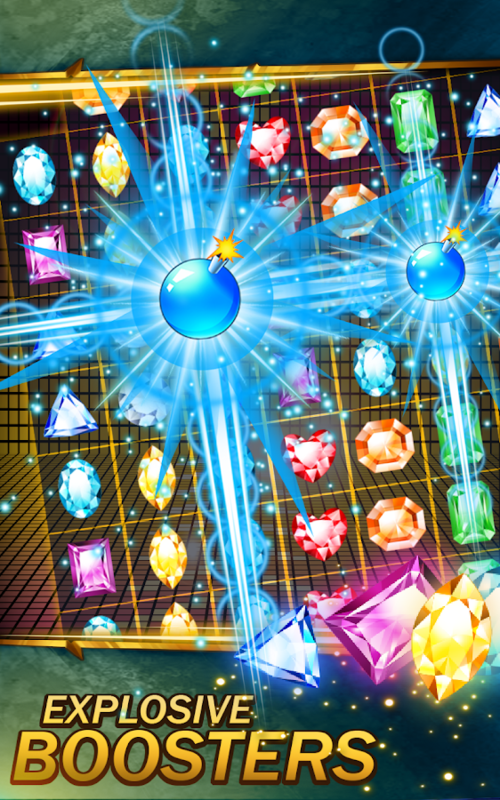 you can freely enjoy the feeling ofbombing holes in the screen, or collecting the special jewels, andadvancing to higher levels of diamond dash magical gems.this gameis the best in all the jewel, diamond, bubble, gem, ruby, candy,fruit, cube elimination games. 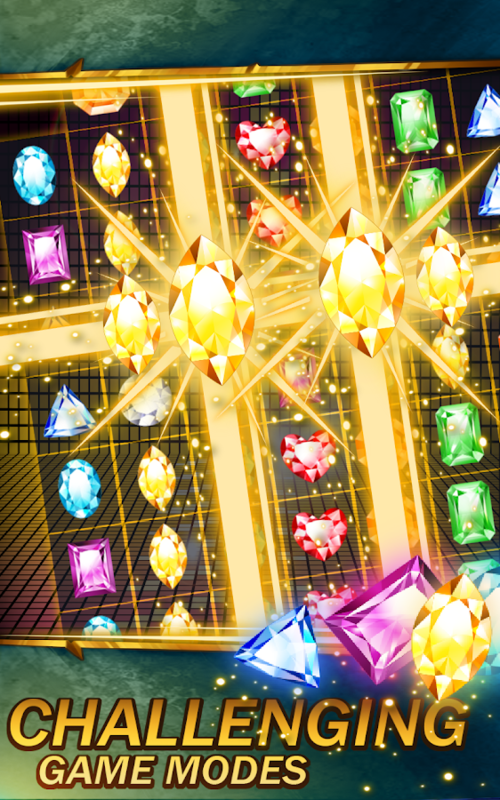 Also best in dash, match, crush,rush, blast diamond games.Enter the Diamond Tap magical story,smash the jewels, collect special surprises, gently move the gems ,and win amazing rewards.In this fantastic Diamond Tap legendadventure , you can become a tap diamond jewels digger and joinother champions and compete with your friends ,just control thesediamonds crush , tap , blast , or move.It will be a Diamond Tapjewels saga world , a bejeweled dashing jewels diamond adventure!You can call it a funny game, nice game, good game, action game,arcade game, board game, puzzle game. It's all in one. Once youdownload it, you will love it.Features,**All levels are Free, andthe game becomes more complicated as you go on**amazing diamonds,and new special adventures and rewards along the way. **blow up thescreen with Mega-Bombs, smash special crates and hit with amazinglightning**When you get stuck, wait for a hint to help you,**Easybut funny to play, a challenge to those who can open much morelevels,**Suitable for all ages,**Cool game pieces,**variety ofSound, and enjoyable music. **Share it with others.If you have ideasfor new levels please tell us about it, write a feedback we willappreciate it!! !Thanks for all the support!!! Diamond Twister is a fun jewels match 3 diamond game, there aremany different levels, each level has different rules, limitedmoves, limited time, blow a hole in the screen with special bombs,start diamond twister lightning storms and much more !! !just switchor match 3 or more diamonds. you can freely enjoy the feeling ofbombing holes in the screen, or collecting the special jewels, andadvancing to higher levels of jewels smashing.Enter the diamondtwister world , dash the jewels, collect special surprises, gentlymove the gems , and win amazing rewards.In this fantastic game ,you can become a professional digger and join other champions andcompete with your friends ,just control these diamonds crush ,splash , blast ,or swipe .have fun , It will be a diamond twisteradventure ,Features,**All levels are Free, and the game becomesmore complicated as you go on**amazing diamonds, and new specialadventures and rewards along the way. **blow up the screen withMega-Bombs, smash special crates and hit with amazinglightning**When you get stuck, wait for a hint to help you,**Easybut funny to play, a challenge to those who can open much morelevels,**Suitable for all ages,**Cool game pieces,**variety ofSound, and enjoyable music. **Share it with others.If you have ideasfor new levels please tell us about it, you leave a feedback wewill appreciate it!! !Thanks for all the support!!! Gummy is a MATCH 3 YUMMY Gummy candy game ,700+ new levels of gummybears crushing and the game is completely FREE with many new match3 challenges of candy puzzle adventures!Playing Gummy you need tomatch 3 of the yummy gummy bears and crush the gummies candy byswiping to MATCH 3 or more of the same color .Match more than 3candies to get rewards and launch a candy rocket that will deletefull rows or blast lines of sweet gummy bears!Get crazy YUMMYboosts and surprises such as big bombs which will blow a hole inyour screen and LIGHTNINGS which will destroy the Gummy gamepieces.Join now to play the candy gummy mania adventure , tosatisfy you craving for sweet candy and win the game.Hurry up andbecome the champion candy Gummy bears SMASHER and compete with yourfriends!☆☆☆ Gummy Features ☆☆☆★ more then 700+ yummy challenges inthe new gummy levels and many more to come!★ New gummy challengessuch as limited time and moves and max amount of points! 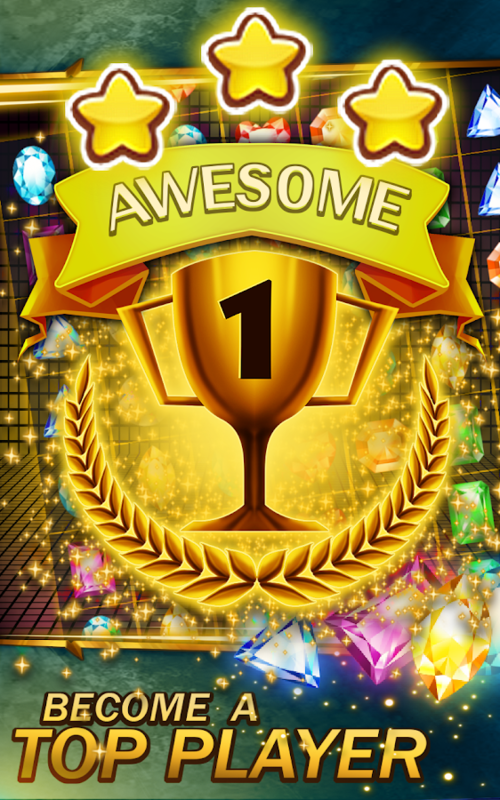 ★ Gummy isan easy to start candy adventure, but its a hard MATCH 3 puzzlechallenge to master!★ great new design and sound effects such asBOMBS blast and LIGHTNINGS!★ Gummy game is suitable for all ages!Start your SWEET candy mania story now! and join the candy starsof gummy bears land. Atlantis is a fun match 3 diamond jewels game, a deep oceanunderwater jewels adventure.there are many different levels, eachlevel has different rules, limited moves, limited time, blowspecial jewel bombs, just switch or match 3 or more diamondjewels.you can freely enjoy the Atlantis feeling of bombing holesin the screen, or collecting the special jewels, and advancing tohigher levels of underwater diamond jewels dashing.Enter theAtlantis match 3 jewels dash world , smash the underwater Diamonds,collect special surprises, gently move the gems , become anunderwater jewels bubble shooter and win amazing rewards.It will bean Atlantis diamond jewels underwater adventure saga , a diamondjewels dash world!Features,**All levels are Free, and the gamebecomes more complicated as you go on**amazing jewels, and newspecial underwater match 3 adventures and rewards along theway. **blow up the screen, smash special crates and bomb underwaterjewel bombs**When you get stuck, wait for a hint to help you,**Easybut funny to play, a challenge to those who can open much morelevels,**Suitable for all ages,**Cool game pieces,**variety ofSound, and enjoyable music. **Share it with others.If you have ideasfor new levels please tell us about it, you leave a feedback wewill appreciate it!! !Thanks for all the support!!! 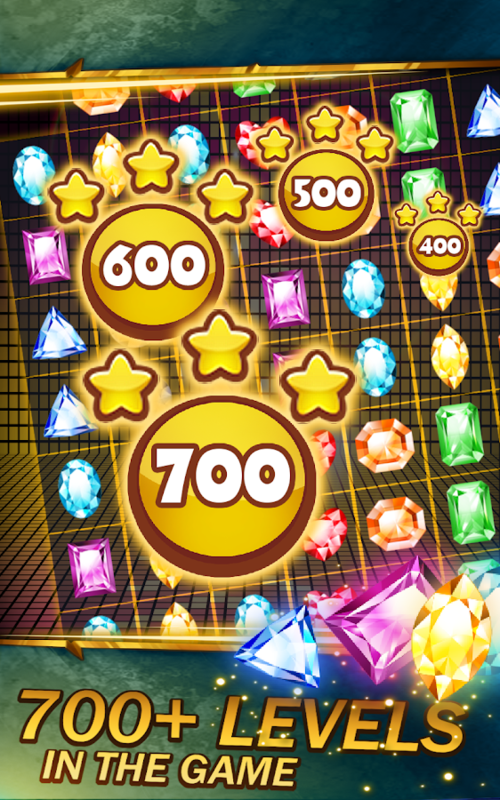 DIAMOND is a unique JEWELS CRUSH game, it is completely FREE andbrings a crazy amount of SMASHING excitement!Playing this game youneed to crush the the shining jewels by placing them around toMATCH 3 of themMatch more than 3 shining diamonds and get afascinating bonus which will make you go crazy!You can get a a hugenumber of JEWELS boosts and surprises such as POWER BOMBS whichwill literally burn a hole in your screen.Get a spectacularlightning by simply matching game elements next to a special item,the lightning will crush and burn the game pieces, giving you aDIAMOND DASH mind blowing fun like no other!Join now the epicJEWELS CRUSH story, this game's crazy action will bring you hoursof amazing experience and endless DIAMOND DASH challenges.Hurry upand become the king of crushing!☆☆☆ Highlighted DIAMOND Features☆☆☆★ 100 and more spectacular FREE levels and many more to come!★Countless different DIAMOND challenges such as limited time,limited moves and max amount of points, which became more difficultas you go forward with game★ DIAMOND is easy to practice and coolfun, however it is a challenge to master!★ Beautiful graphics andunbelievable visual effects such as bombs and lightnings★ Fun musicand game sounds which fits perfectly the JEWELS CRUSH challenges★Designed for all agesStart your JEWELS CRUSH saga now! Try to scorehigh enough and get 3 stars on, every level!Send us your thoughtsabout the game so we will be able continue improving DIAMONDexclusive and fun experience. Cake Mania is a free and sweet cupcake crushmatch 3-puzzle game.Enjoy many delicious cake levels; each level has different rulessuch as limited moves and time.Just match 3 or more yummy desserts and use sugary dinner dashbombs to crush the Cake Mania game pieces.You can freely experience the Cake Mania feeling of both bombingchocolate holes in the screen, collecting the vanilla boosts andadvancing to higher levels.Enter the Cake Mania free match 3 game, dash the sweet candies,collect special dessert surprises, become a master crusher and winamazing rewards.In this fantastic cupcake story, you can become a fearlessshamrock cake leader.Start your dessert mania now! You will enjoy dashing andsplashing a verity of sweets such as chocolate cookies, fruit jellyand shamrock cake.Top Game Features:* The entire game levels are free! * Cake Mania becomes more complicated as you go on* Amazing delicious adventures and sweet rewards along theway* When you are stuck, wait for a hint to help you* Easy to play but a challenge to master* Suitable for all ages* Cool delicious visual and sound effectsHurry up and begin your match 3 sweet cupcake crush adventurenow!If you have ideas for new Cake Mania levels please tell us aboutit by leaving us your feedback. DIAMOND CRUSH is a free diamond jewels game, it is completely FREEand brings an endless supply of fun.Playing Diamond Crush you needto smash the jewels by swiping to create a match 3 matches .Matchmore than 3 of those amazing diamonds and get treasure rewardswhich will make you want to jolly shout DIAMOND CRUSH !You will getdozens of boosts and surprises such as ULTRA BOMBS which willliterally burn a blow a hole in your screen.Get diamond twisterlightning storm by simply putting 3 gems next to a special item,the lightning will smash and the DIAMOND CRUSH game pieces, givingyou a unique experience like no other!Join now the best jolly sagadiamond jam, this game's super action will make you call all yourfriends and tell them what an unrealistic experience is DIAMONDCRUSH.Hurry up and the master crusher of the entire galaxy!☆☆☆Highlighted Features ☆☆☆★ Countless wonderfully designed FREElevels and many more to come!★ Dozens of different challenges suchas limited time, limited moves and minimum amount of points, whichbecomes more sophisticated as you progress with the game★ easy tolearn, nevertheless it is a challenge to master!★ Mind-blowinggraphics and top of the art visual effects such as bombs andlightnings ★ Lyric music and game sounds which fits perfectly theamazing challenges★ Kids of all age can play this game please sendfeedback about your experience playing this game so we will be ablecontinue improving the game.